Roma, TX – Roma Gladiator swimmer, Juancarlos Aldape can hardly contain the excitement he feels about returning to the UIL State Swimming Meet in Austin, Texas February 25-27, 2010. Last season, Juancarlos earned a trip to the State Meet as a freshman by qualifying as the Regional Champion in the 500 freestyle and placed 10th in that event with a best time of 4:57. 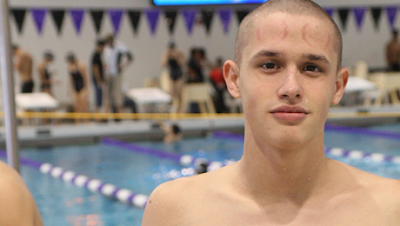 This season, Aldape has qualified in two events as the Regional Champion in the 500 and 200 freestyle. “My immediate goal is to better my time in both events and if I medal, well that would be the icing on the cake,” said Juancarlos. ”My best time this season in the 500 is 4:52.82 and in the 200 it is 1:47:11. The times to beat at the state level are 4:42 and 1:42 respectively so I’m preparing to swim my best once I get there,” Aldape added. Juancarlos employs a practice regimen that includes a rigorous weekly workout at the Gladiator Natatorium mixed together with meditation exercises incorporating music he likes to listen to like Eminem and Green Day. But he is also a determined student of the sport and analyzes his performance after each event by studying video and listening to his mentor, Roma Swim Coach Calvin Snyder. “Juancarlos challenges me to come up with innovative workouts that push him to his limits,” said Coach Snyder. “I’m looking forward to seeing him at the State Meet and moreover I’m looking forward to seeing the entire team perform at the State Meet next year,” added Coach Snyder. Juancarlos credits his parents and family for providing the motivation he needs to excel in swimming and as a student at Roma High School. Aldape remembers beginning to swim as young as three years of age and at age 8 he was already participating in competitive events. Aside from improving his swimming ability, Juancarlos is looking forward to completing the requirements for a high school diploma and pursue another one in college. He aspires to swim for a university team and tacks on one more….qualifying for an Olympic team!